When someone creates a significant work of art, it needs to be preserved so that later generations can experience it. Each medium has its challenges, whether it be preserving a painting's color and condition, ensuring a book is widely available, or re-releasing a movie on the latest formats to ensure it's easy for modern viewers to play. In this respect, games are a unique challenge. To bring a classic game onto modern hardware, developers have to contend with advancements in the way processors and graphics cards work, changes in control methods and game design, and even the ever-increasing resolution of gaming platforms. Many of the remastered and re-released games we're seeing lately are just a few years old. They feel more like they're just a way for developers to monetize the time they spend learning new consoles. Grim Fandango was originally released by LucasArts on Oct. 30, 1998. That fall also saw the release of Metal Gear Solid, Half-Life and The Legend of Zelda: The Ocarina of Time. Gamers think of all as a busy time when all the big games come out, but that's a pretty ridiculous list. 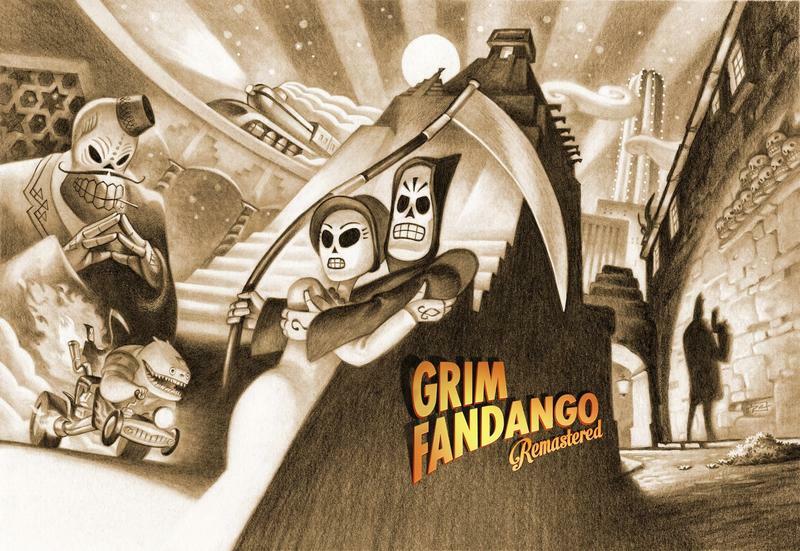 Grim Fandango was one of the last entries in the dying adventure game genre, and a PC game to top it off. It did well critically at the time, but didn't sell nearly as much as any of those contemporaries despite the praise. Just like the characters that populate the Land of the Dead, though, Grim Fandango has a chance at life after death through this remaster from Double Fine Games, headed by Tim Schafer, the mind behind the original. Grim Fandango is the perfect example of the kind of necessary remaster I want to see more of. A remaster review is always going to be a bit different from reviewing and original game. The questions are a bit more focused. How does the game hold up mechanically and aesthetically? How true is the game to the vision of the original? How well does it work? How much of our love for the game is fueled by nostalgia rather than actual merit? Very little has changed about Grim Fandango, and that is, for the most part, a good thing. The game is set in one of the most creative, memorable worlds I've ever seen in gaming. It's one that stuck with me for 16 full years since the release of the original, and I was just as excited to be back in it this week as I was to see it for the first time then. Grim Fandango introduces us to Manny Calavera, a travel agent in the land of the dead. When people die, the grim reaper's job is that of travel agent. Manny reaps souls and helps them find the right travel package to get them from purgatory and into the great beyond. The setting is a sort of mash-up of Mexican Day of the Dead art, Art Deco architecture, and a dark, film noir setting. The art is still gorgeous, if a little muddy. The original art has been left almost entirely intact. Because it was made from clean lines and colors at the time, it hasn't suffered much in the intervening decade-plus.The characters have all been redrawn, though, and you can see the difference by – if you're on PC – hitting tab to go back and forth between the original and modern graphics, just like in the remasters of the Monkey Island games from a few years back, as well as the recent Halo compilation. I'd be lying if I said it didn't look a bit outdated, but it's made the transition heroically considering its age and the visuals of most of the games coming out around that time. The story and voice acting remain as unchanged as the art and like it, they hold up very well. Many times when a game decides to use multicultural influences to flavor its narrative, that content can later come across as tone deaf. It's quite the opposite here. Tim Schafer combined film noir tropes and Latin American culture in ways that are not only funny but still feel fresh. Those noir tropes inform the story – give you an idea of how it's going to go, setting important scenes – without being slavishly devoted to recreating the movies the ideas are pulled from. It's more like Schafer picked the essences of those famous films and books and used those, rather than depending on us getting a reference that might become quickly outdated. From a gameplay perspective, there are some pretty major changes, but they're for the better. Puzzles are all still intact and as confusing as ever. Don't be afraid to reach for a FAQ if you want to just experience the game's awesome writing and voice acting. These puzzles are classic adventure game fare, hard as heck and often quite opaque. There's no hint system built into the game. What has changed, though, is the way you interact with the game. Grim Fandango's most infamous element, despite its great reputation among fans, was its tank controls. While adventure games depended on the point-and-click style of interaction, Grim Fandango wanted to put you in Manny's shoes and did so by giving you direct control. This resulted in tank-like controls that were certainly quite manageable but much more difficult to learn. This time around, the team at Double Fine has implemented – with consultation from the modders who originally built them – mouse-driven control and camera-relative movement. Point and click movement lowers the barrier of entry significantly and makes the game a breeze to play. Part of the value in a remaster is accessibility, and this makes the game more accessible without doing anything to dim the original experience. The camera-relative controls – meaning that the controls move you in different directions based on the placement of the camera – are much friendlier than the tank controls as well. It is an old game, though, and there are some bugs. They're rare, but they're there. I recommend keeping a rolling save just in case, but you may not ever have to use it. The other changes to the game include a developer commentary that is often educational and sometimes as funny as the game itself, and a few different options for aspect ratio, including the game's original 4:3 resolution and a new widescreen resolution. Disclaimer: We received a copy of Grim Fandango for the PC via Steam from the publisher. We finished the game before writing this review.